Flu season in the U.S. peaks between December and February, according to the Centers for Disease Control and Prevention, with cases seen as early as October and as late as May. Take these precautions around the home and the office to prevent getting this potentially serious disease as well as the milder common cold. While no vaccine exists yet for the cold, one does for the main viruses that cause the flu. The CDC recommends getting the vaccine as early as possible in the year, either as a shot or nasal spray. Anyone ages 6 months or older can be vaccinated, with those younger than 8 years of age needing two vaccines given at least four weeks apart. It takes about two weeks for antibodies to develop. The CDC recommends that everyone get vaccinated. Make that happen within your family and encourage co-workers—or employees—to do the same. If you need help finding available flu vaccine, use this handy flu shot map. The flu virus can spread up to 6 feet by droplets sneezed or coughed out by an infected person. If an employee in your office gets the flu or a cold, insist they stay home. That’s what sick days are for, after all. If a family member gets sick, it proves a bit more difficult to limit contact with them, but you can take certain precautions to avoid infection. These same steps help prevent the spread of other viruses, including those that cause the common cold. The CDC recommends routinely cleaning frequently touched surfaces that can spread flu and cold viruses from one person to another. In the home, that includes handles on doors, water faucets, refrigerators and remote controls. At the office, add shared keyboards, phones and other accessories to the must-disinfect list. To ensure a thorough cleaning, as opposed to a quick rinse with water, keep all bathrooms well stocked with soap and paper towels, instead of a common hand towel. When washing hands, do so with warm water and for at least 20 seconds; many parents teach their kids to sing Happy Birthday and not stop washing until the song runs through twice. Don’t forget the backs of hands and underneath fingernails. Also keep alcohol-based hand cleaners and wipes nearby for quick disinfections. Keep in mind that an infected adult can spread the flu virus one full day before developing symptoms and up to seven days after falling ill. Kids can spread the virus for an even longer period of time. If you incorporate the above precautions into your daily life instead of upon learning a family member or co-worker is sick, you reduce the chance of getting infected yourself. According to the CDC, the flu costs the country $87 billion and 17 million workdays each season. Tens of thousands get so sick they must enter the hospital, and thousands die each year from flu-related illnesses. 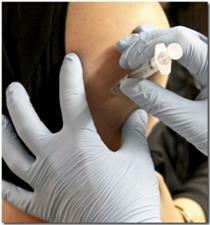 If you are an employer, consider offering those that work for you free flu shots. Healthy employees make for a healthy business, after all.